Kwame Nkrumah Interchange has developed deep and deadly gaping holes eight months after the €74 million project was commissioned. What started as mild vibrations beneath concrete slabs on a portion of the Kwame Nkrumah circle interchange deteriorated into a major road breech, calling into question again the quality of construction carried out on the interchange. 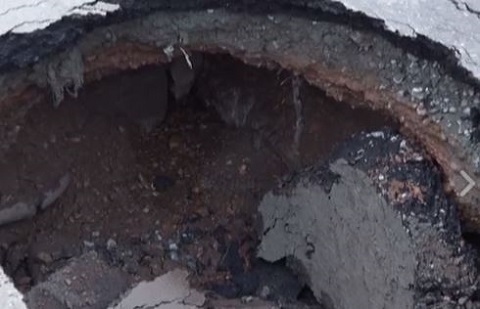 The portion which caved in created a gully in the center of the stretch causing massive gridlock for hours. The situation worsens by the day delaying the flow of traffic. According reports, Brazilian contractors Quieroz Galvao has been to the scene to access the situation. Several pedestrians spoken to by Kasapafmonline.com believe the John Mahama government caused the road to be hurriedly constructed and eventually commissioned a month to the 2016 elections, in a bid to enhance the NDC’s votes.